My friend commissioned this piece as a wedding gift for her friends. I am told it sparked hours of conversation among the family. I’m pleased to hear it. 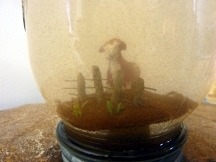 Materials: mason jar, Wyoming red sand, sculpty clay, water; 2010.